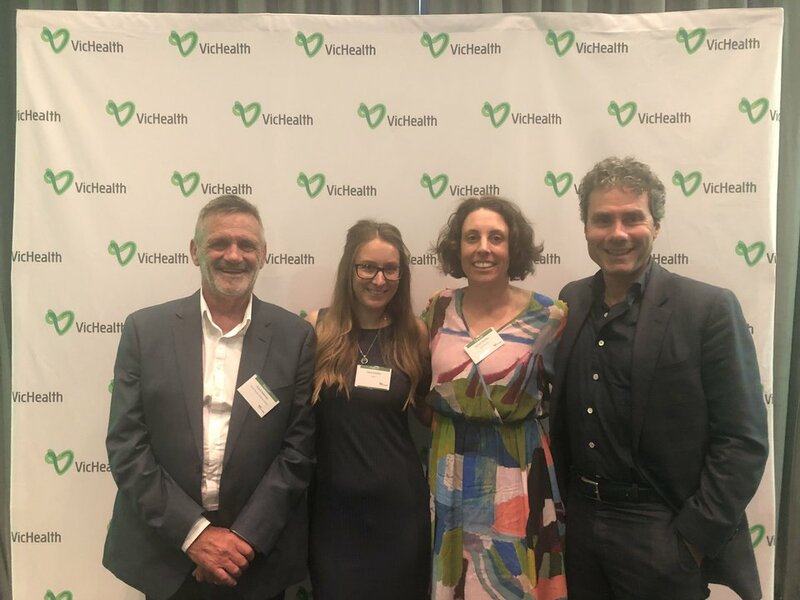 Quit Victoria and its partners in the “Tackling Tobacco Program” have been highly commended for their efforts in working to reduce smoking rates among people living with mental health conditions at last night’s VicHealth Awards. Held annually in Melbourne, the VicHealth Awards recognise those who champion health promotion across a wide range of communities. Quit, NorthWestern Mental Health (NWMH), EACH and Orygen Youth Health (OYH) were praised for their “Tackling Tobacco” efforts and commended in the Preventing Tobacco Use category. Quit’s Community and Programs Manager Rachel Whiffen said the recognition serves as a testament to the hard work and commitment of the Tackling Tobacco partners. “It’s an honour to be recognised for our work in tackling health inequities experienced by people living with mental health conditions,” Ms Whiffen said. NWMH’s Operations Director Peter Kelly said the commendation demonstrates the benefits of working collectively to reduce poor health outcomes among people living with mental health conditions. “NWMH has been confronted by mortality data over the past six years indicating that the average age of death for adult consumers dying of natural causes is 48.7 years, many of which are attributable, either directly or indirectly, to smoking,” said Mr Kelly. The program has enacted meaningful change in other mental health services, with OYH and EACH both remarking on their increased capacity to support those trying to quit. Orygen Youth Health’s Consultant Psychiatrist, Dr Enrico Cementon, said, “At Orygen Youth Health, through the Tackling Tobacco initiative, we've seen young people actively seek assistance to become smoke free, despite the challenges faced when experiencing mental illness as a young person. Through staff training, tailored resources, and local leadership, Orygen is readily equipped to support young people." Cancer Council Victoria had a strong showing at the VicHealth Awards with two other campaigns nominated on the night; the SeeUV app developed by SunSmart, and the Do the home screening test – it could save your life campaign developed by the Screening, Early Detection and Immunisation (SEDI) team. Both were nominated in the Communications in Health Promotion category, with SEDI being awarded for their efforts on the campaign.